The LVL 1 drone from CyPhy uses six rotors for stable flight. A new drone that's due out next year uses six rotors instead of four to help it capture more stable video and spend more time in the air. The LVL 1 from CyPhy Works is on Kickstarter for preorder for $495, though it won't start shipping until February 2016. Most consumer and prosumer drones have four rotors and employ an expensive, delicate gimbal to hold the camera. The gimbal usually hangs under the drone and cancels out any movements of the drone to reduce camera shake. "We've chosen a hex rotor because it gives us the ability to do what we call level-up flight," said Kenn Sebesta, technical lead on the LVL 1. "[The drone] doesn't twist, it doesn't tilt, it doesn't roll, pitch or yaw." The gimbal adds weight, complexity and cost to most drones, and for smaller drones a small amount of weight -- even tens of grams -- can greatly reduce battery life. In initial tests, the LVL 1 (pronounced level one) got more than 20 minutes of battery life, according to its developers -- on par or better than more expensive products. See the drone in flight in this video. One feature that might be useful for new fliers is geofencing. Using a smartphone app, pilots can outline an area they want the drone to stay within during flight. LVL 1 is flown with a smartphone, tablet or remote controller. There's still a lot of work to go before the app will be ready for release. During a demonstration this week, the drone was flown with a hobby remote controller similar to those used with model airplanes. CyPhy is an industrial drone maker, and this is its first consumer drone. Helen Greiner, the company's CEO, co-founded iRobot, maker of the popular Roomba vacuuming robot. 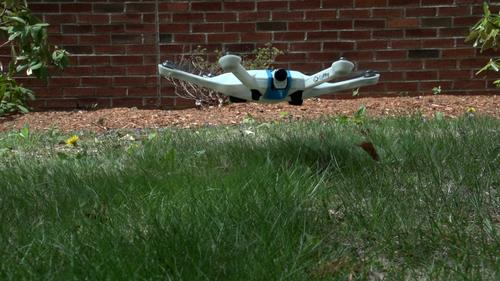 "Drones are very different from ground robots," she said. "We use a lot of the technologies from ground robots, but the whole other aspect of aerodynamics and flight is something that iRobot doesn't have expertise in." When the drone becomes more widely available it will cost more than $600, which is less than the drones from market leader DJI. Nick Barber covers general technology news in both text and video for IDG News Service. E-mail him at Nick_Barber@idg.com and follow him on Twitter at @nickjb.